A TROOP of monkeys at Longleat Safari and Adventure Park have made their own unique tribute to the Ashes. 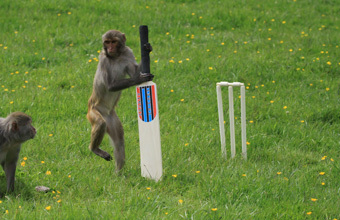 Rhesus monkeys at the Wiltshire attraction appeared to take great interest in the cricket set which was provided for them by keepers. Longleat's Ian Turner said: "It would be something of an exaggeration to say they grasped the finer points of the game - within minutes of setting it all up one of the younger males ran off with the ball and refused to give it back. "That didn't seem to put the others off though and one individual seemed very keen on holding on to the cricket bat - I know that Botham in his pomp was affectionately known as 'Guy the Gorilla' and it looks like we might have discovered our own miniature version."